8458. [model kit] U. S. Coast Guard 36-Foot Motor Lifeboat. c.1989. Complete unassembled plastic model kit by Glencoe Models reproduces this renown rescue craft in splendid detail, including all decals and three scale figures. This sturdy craft has been responsible for the rescue of hundreds of seamen and now you can build one for display on your shelves too. This is a High Quality, injection molded plastic, made in the USA Coast Guard Rescue Boat Model Kit - 1/48 scale including three figures. This is a Hard to find Glencoe Model, known and respected by model collectors and aficionados world wide. Award Winning unique model made from the highest quality materials. Certain to create hours of excitement for any model enthusiast. 1/48 scale, unassembled kit. 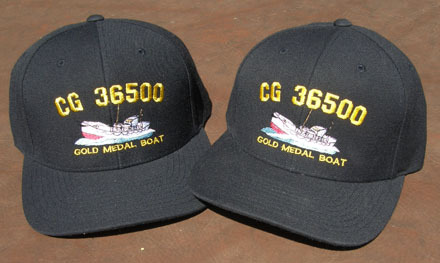 Includes new decal set for CG-36500. (M). $24.98. 11” x 14” and include mat for overall 16” x 20”. Each print signed by the artist. Perfect for decorating. 1713. 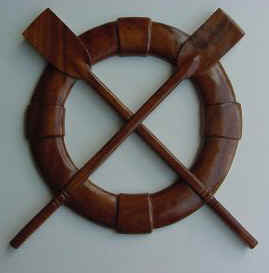 (wood model) U.S. Life-Saving Service Pulling Surfboat 22 ½”. This is an all wood plank on frame model of an U.S. Life-Saving Service Pulling Surfboat. The model measures: 22 ½” length x 6 ¾” wide x 7” high not including stand. It is a replica, though not exact, of a Jersey type pulling surfboat and is ready to display. The model is 100% hand built from scratch by skillful master craftsmen of wood with plank-on-frame method of construction and is extensively detailed in and out! 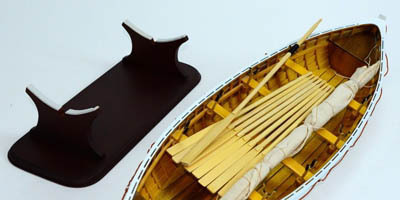 Model includes 8 oarlocks and 8 pulling oars, and one steering oar as well as mast with boom and sail, although there is no bracket for displaying the model with the mast erected. The boat is painted white and lettered U.S. Life-Saving Service and Seabright (which you could change to suit your location. A stand is included. 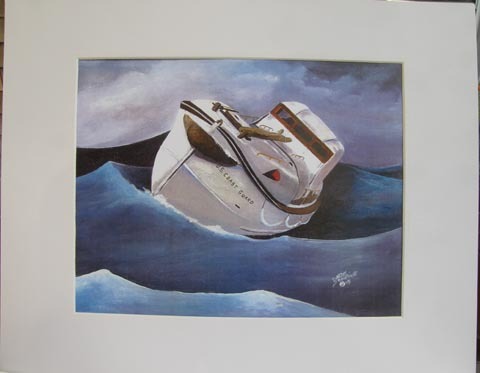 This is a very impressive boat and would be a beautiful centerpiece for your library, shelf or table. Ready to display from the box. New. (M). $235. 26246b. [Reproduction SURFMAN’S CHECK] Replica United States Life Saving Service "SURFMAN’S CHECK” replicates those issued in the Nineteenth Century to surfmen patrolling the beach. 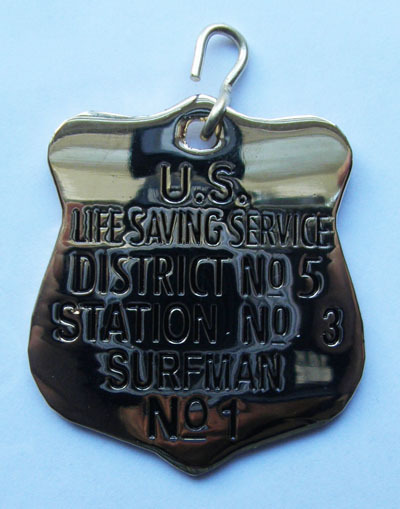 This check, based on an original, reads: U.S. * LIFE-SAVING SERVICE * DISTRICT No.5 *STATION No 3 * SURFMAN No.1. [Indian River LSS, Delaware] The check is made of brass and has a beautiful polish and black paint-filled lettering. Each surfman, during his nightly beach patrol, would exchange his “check” with that from the neighboring station, thus proving that he had completed his assigned patrol. This high quality replica is on heavy brass and would be perfect for display, as a watch fob or as a gift. Measures 2 ¼” high by 2” wide. (M). $9.95. 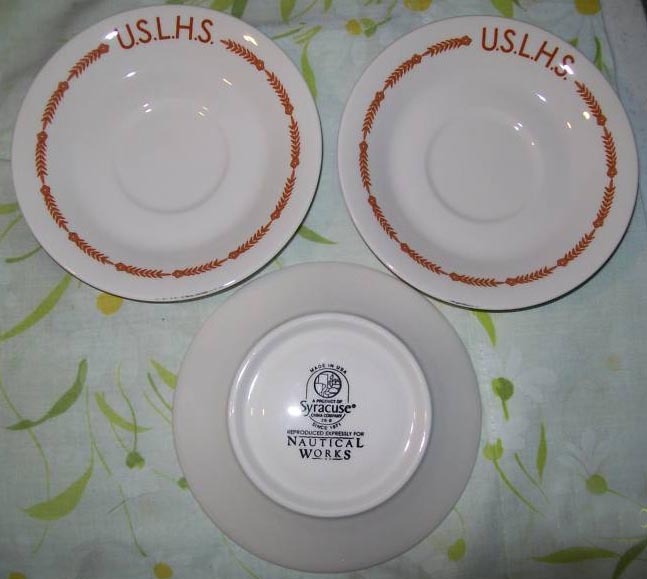 D&D Lines - United States Lighthouse Service Logo Reproduction Dinnerware. Long ago discontinued, this wonderful quality china is much sought after. We find a few pieces now and then. 2566-1,2,7,9,10. 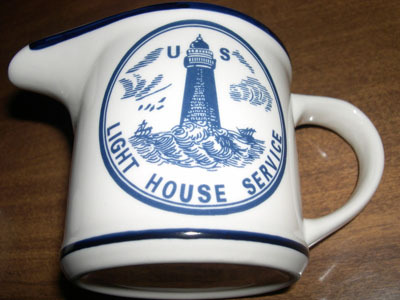 Lighthouse Service Mug (9 available) $54.95 each. 2566-3,5. 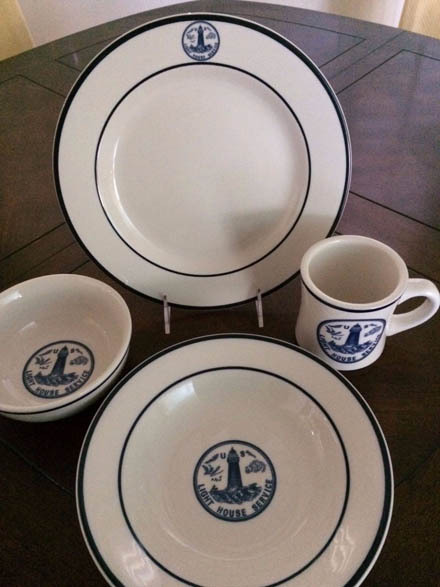 Lighthouse Service Dinner Plate (2 available) $54.95 each. 2566-4,6,-17,47,48. 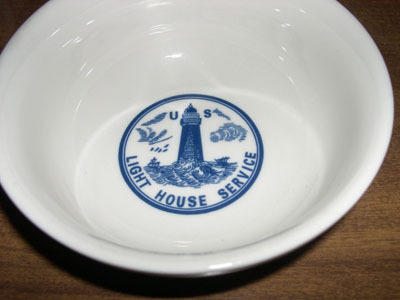 Lighthouse Service Cereal Bowl (6 available) $54.95 each. 2566-15. 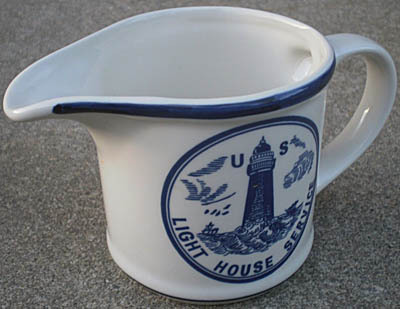 Lighthouse Service Soup Bowl (8 available) $54.95 each. 2566-29,-31,-36. 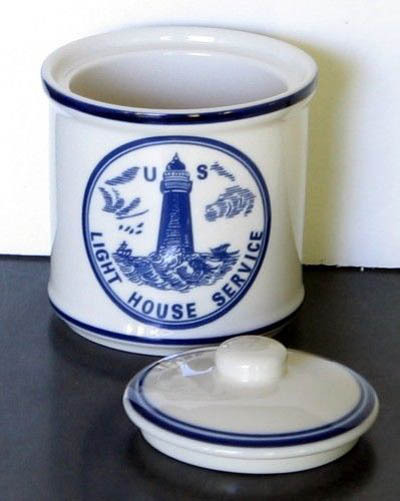 Lighthouse Service Sugar Bowl (3 available) $84 each. 2566-29,-30. 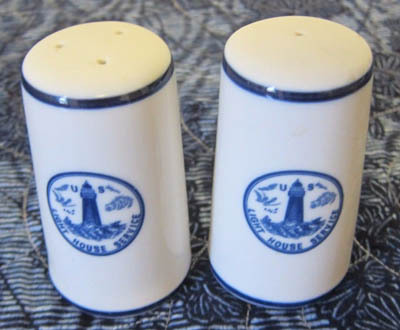 Lighthouse Service Salt & Pepper Set (2 available) $76 set. 2566-8. 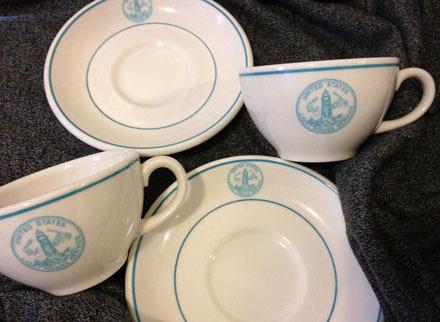 (set 4 pieces) Lighthouse Service Mug, Dinner Plate, Cereal Bowl, Soup Bowl $169.95 each. Please inquire. 28121b. 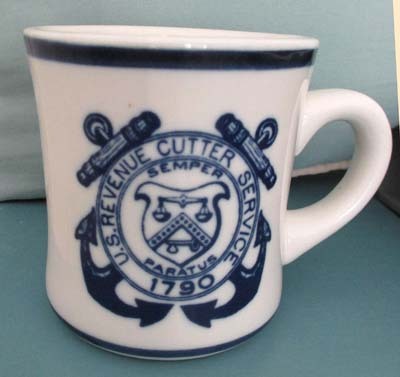 Revenue Cutter Service Mug (1 available) $42.95 each. 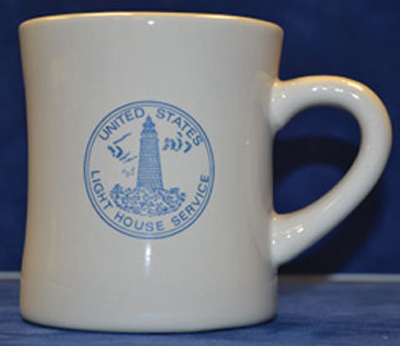 Now Available: United States Lighthouse Service & Lifesaving Service heavy weight 10 ounce mugs. $8.95 each. 12119a. 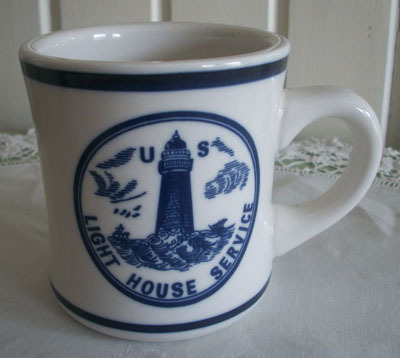 (reproduction mug) United States Lighthouse Service Mug. 10 oz. $8.95 each. 12119b. 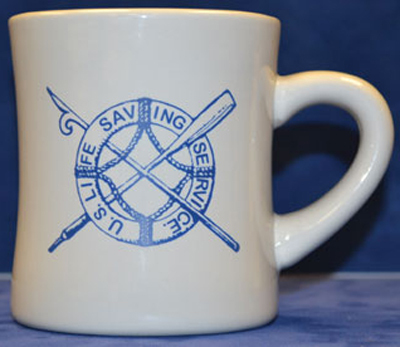 (reproduction mug) United States Life-Saving Service Mug. 10 oz. $8.95 each. 13240. American Flag. 3’ x 5”. 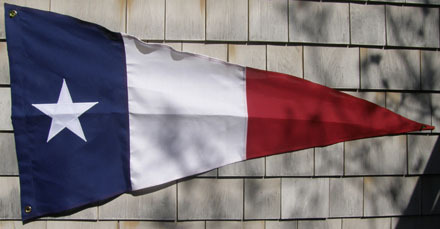 Sewn nylon flags are the most popular outdoor flags. They are very attractive to look at, durable, affordable, and they fly with the least wind. Our flags are beautiful with embroidered stars and sewn stripes , very durable, should typically last 12 months or more. These flags are 100% Made in the USA of Dupont Solarmax nylon fabric with 4 rows of stitching on fly end, and strong brass grommets. Perfect for flying at your home or camp. New, Made in USA. $21.95. 13107. 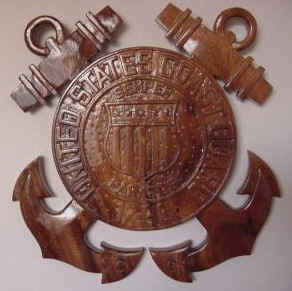 Rustic Cast Iron U.S. Lighthouse Service Insignia Sign 9”. 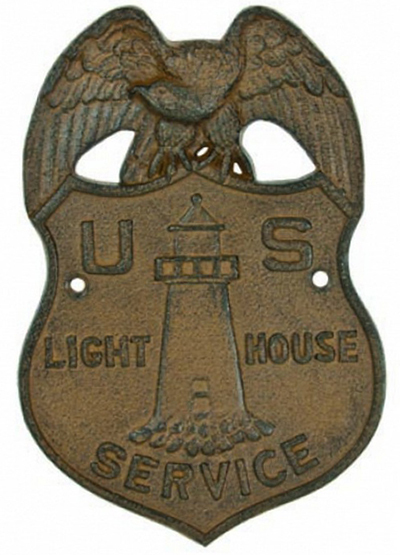 Dimensions: 6" L x 2" W x 9" H. Solid, sturdy, and durable, this cast iron U.S. Lighthouse Service insignia reproduction is hand crafted from cast iron, based on the old Lighthouse Service Watchman’s badge design. Would be most attractive on your door or wall for decoration. With two holes for mounting. (M). $29.95 each. Say "Hello" to your Favorite Lighthouse Keeper with our Reproduction of the Original United States Lighthouse Service Triangular Station Flag. 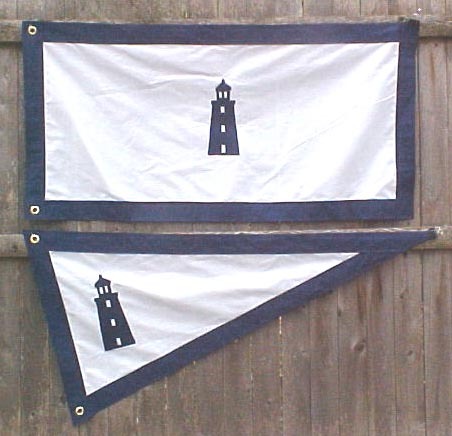 Treat your family to these replicas of the official sewn U. S. Lighthouse Service flags. 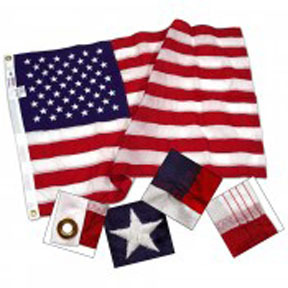 Flag is professionally made in the United States of high quality two-ply spun woven polyester flag material, double sewn, with appliquéd (hand sewn) pattern, reverse back and finished with brass grommets for attaching to halyard. Professionally made to withstand rugged use. Regarding our flags, one customer noted: "It arrived. I love it and so will our neighbors. Happy holidays. Virginia"
10281. [reproduction] U. S. Lighthouse Service Station Flag. 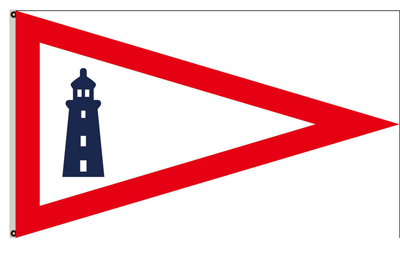 This triangular station flag measures 48” long by 25” and is typical of the flags once flown on Lighthouse Service vessels and at the light stations for over one hundred years. The flag is of the standard design, with red border on a field of white, with a large blue lighthouse silhouette. Heavy duty for moderate weather conditions. Made in America. (design as shown above) $98.95. Photo courtesy Chad Kaiser, U.S.L.H.S. 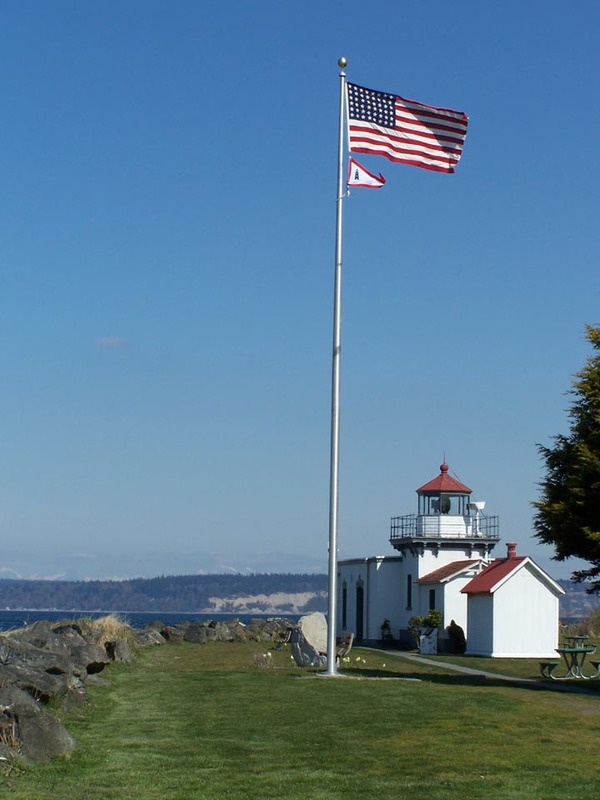 Our flag shown flying at the headquarters of the U. S. Lighthouse Society at Point No Point Lighthouse, Washington. 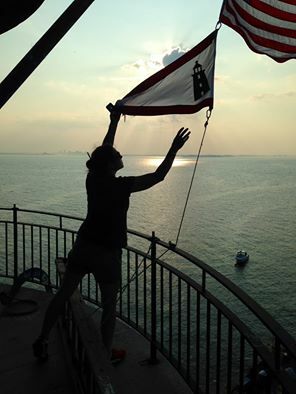 Our flag shown being raised at the Graves Lighthouse in Boston Harbor. 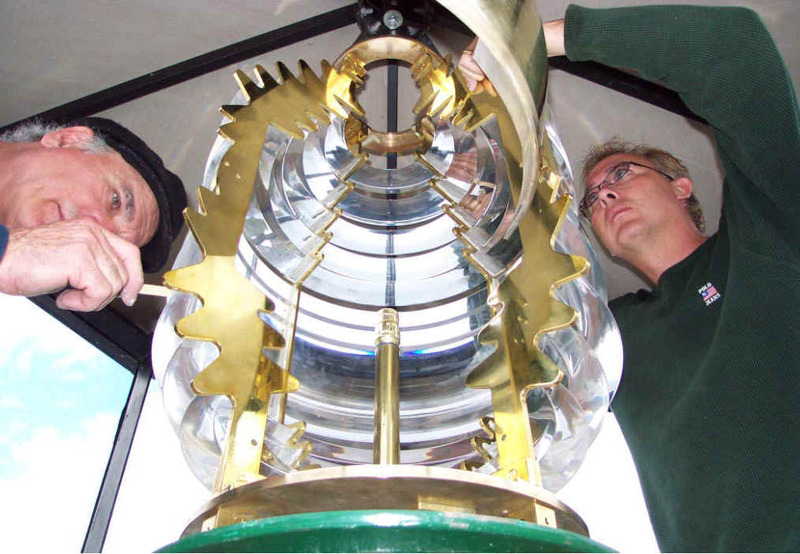 The light, now privately owned, is being carefully restored and cared for by its new owners. 1521c. [reproduction] U. S. Lighthouse Service Station Flag. This triangular station flag measures 59” long by 35” high and is reminiscent of the flags once flown on Lighthouse Service vessels and at the light stations for over one hundred years. The flag is rectangular, printed with the standard pennant design, with red border on a field of white, with a large blue lighthouse silhouette. 100% polyester. Light weight with sewn edges, hem with two brass grommets. For light occasional use or display. Imported. (M). $29.95. CP-01. 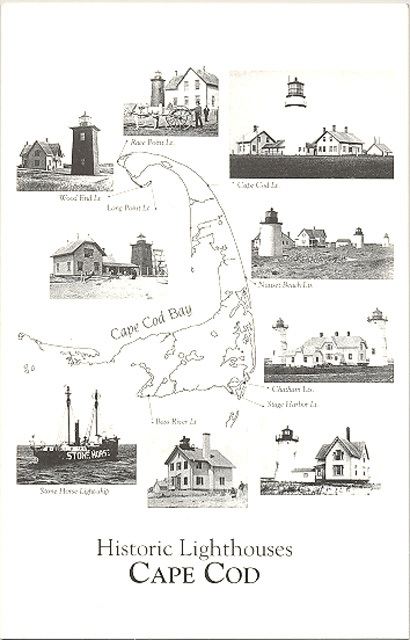 Historic Lighthouses Cape Cod Print. The Historic Lighthouse series of prints uses rare photos from the 1800’s showing American Lighthouses in their turn-of-the-century splendor. Using sophisticated twentieth century computer enhancement, these specialized prints are produced on quality 80lb. bright white paper stock. Each print shows beautiful clear 1800’s views from original period photographs. These prints measure 18” wide by 24” high and, because of the fine quality, these make wonderful candidates for framing and decorating. Watch also for future prints featuring vintage photographs and architectural plans of other locations. (Actual size 18”w x 24”h, shipped rolled.). Historic Lighthouses - Cape Cod. Retail priced at $14.95. 21444. Lighthouse Stationery. Create outstanding Letters, Reports, Correspondence, Memos. High quality, 8½” x 11”, 24lb. bond paper available in packs of 25, 50 or 100 sheets, compatible with Laser Printers, Photocopiers, and Ink Jet Printers. a. Pack of 25 sheets $3.99. b. Pack of 50 sheets $5.99. c. Pack of 100 sheets $7.99. 11397. 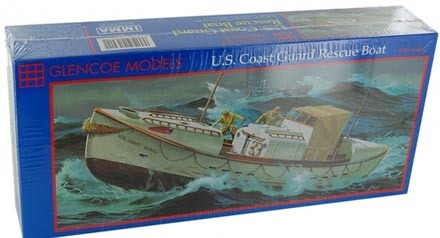 (wood model kit) U.S. Coast Guard 36' Motor Lifeboat CG-36500, 1/16th scale by Dumas Products, "The Model Boat People". This is an all wood kit featuring plank on frame balsa strip construction with die-cut parts for the superstructure. 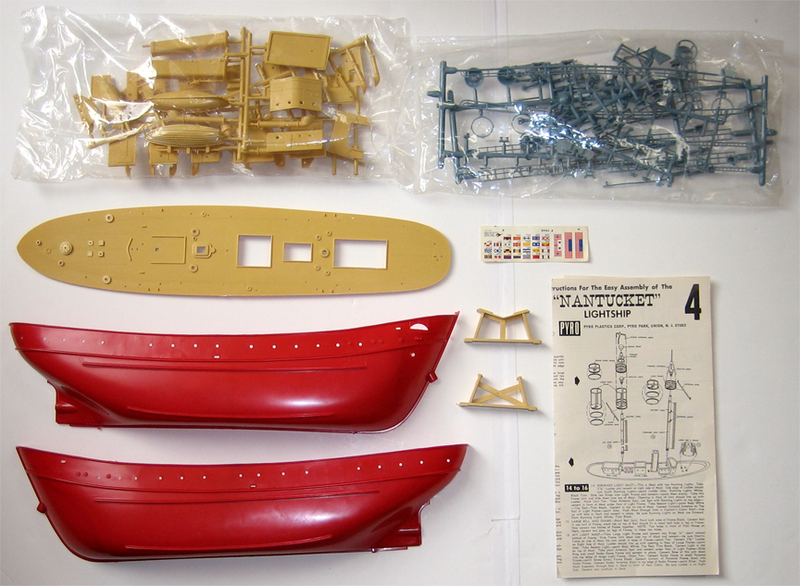 The kit includes cast fittings, mounting stand and Coast Guard insignia and decals. Finished model is 27" long with a 8" beam. The CG 36500 is famous for the rescue of 32 men from the tanker S. S. Pendleton, which broke in half during a winter storm off Chatham Bar, the elbow of Cape Cod (also known as New England's graveyard of ships). On Feb. 18, 1952, Bernard Webber, Andrew Fitzgerald, Richard Livesey and Irving Maske from Life Boat Station Chatham, Mass., braved 60-foot seas aboard the Motor Life Boat CG36500 to rescue the crew of the S.S. Pendleton that had broken in half during a winter storm off the coast of Cape Cod. At the end of the mission, the crew of CG36500 had saved 32 of Pendleton’s 33 crewmembers. 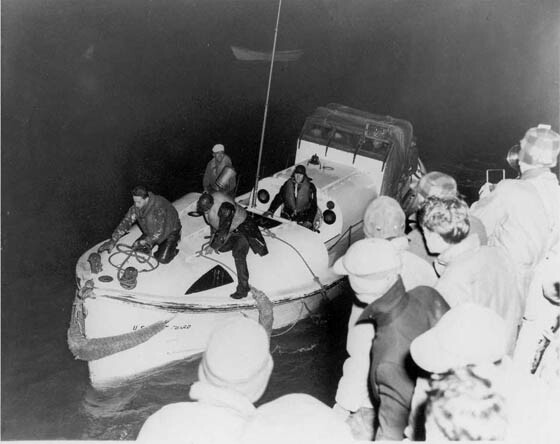 To this day, the saving of the Pendleton crew remains the single greatest small-boat rescue in the history of the United States Coast Guard. The crew received the Gold Life Saving Medal for their efforts during this almost impossible rescue. Also available separately is the Dumas Running Hardware kit (DUM2371) to make this an RC Boat! This is a BRAND NEW factory sealed kit. Just released. (M). $188. 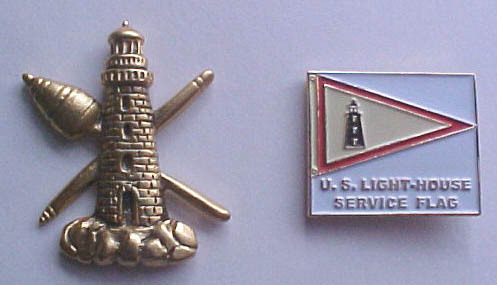 Lighthouse Lens and U. S. Life-Saving Service Rubber Stamps. In response to your requests for the Rubber Stamp that I use on my mailings and packages, I have commissioned to have produced three designs of lighthouse lens and Life-Saving Service insignia. Each detailed lens image measures approximately 3” high by 2” wide, while the USLSS stamp measures approx. 2” square. Stamps are of commercial quality and are mounted on solid wooden pads with wooden handles. Choose From Three Designs ! Made in America. #6654. 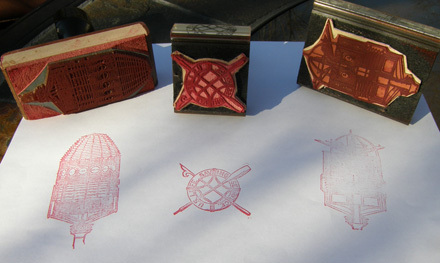 Stevenson’s Improved Lens Rubber Stamp. 3”H x 2”W. $17.95. #6653. Fresnel Lens Rubber Stamp. 3 3/8”H x 1½”W. $17.95. #795. Life-Saving Service Insignia. 1 ¾”H x 1 ¾”W. $16.95. 957nnn. 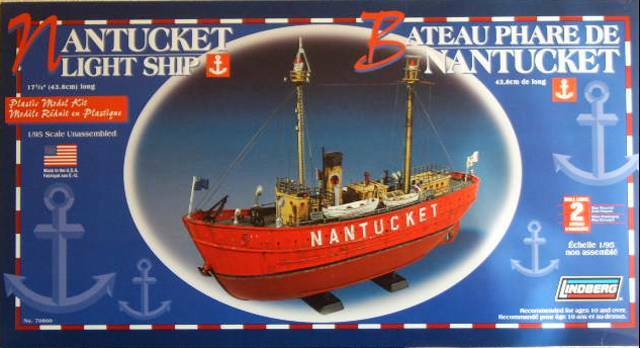 (lightship model kit) Nantucket Lightship No. 112. WAL 534. 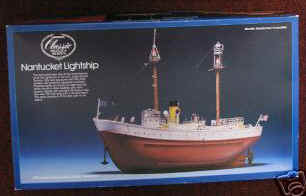 Finally Liondberg has retooled and begun to offer this sought after model kit of the Nantucket Lightship No. 112. 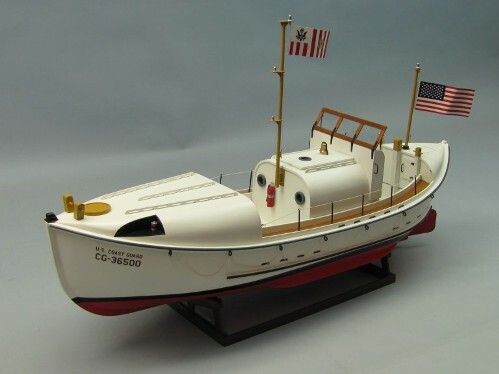 This kit #70860, copyright 2007, is a 1/95 scale replica, 17 ¼” long, still manufactured in the USA, and one of only a few ever designed of a U. S. light vessel It is also fairly close to HO railroading scale of 1/87. It had its origins as the Pyro kit of the same subject in the late 50s. Lindberg bought the molds and produced the kit for a few years and then ceased production for many years. It has been sought after for many years since going out of production in the late 1980’s, and now they have brought it back. This is complete and unassembled, in new condition and factory sealed, and is a perfect way to spend the cold days remaining of winter. This is an exceptional find for you lightship enthusiasts. For those of you who would prefer the original Pyro or Lindberg model, we have those available as well. Unassembled kit. (M). $58 net. 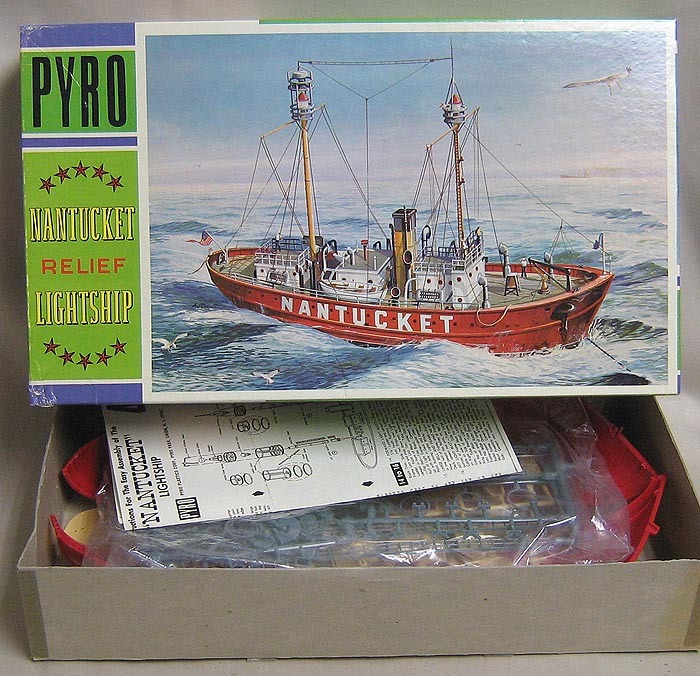 957 [lightship model] Nantucket Lightship No. 112. WAL 534. 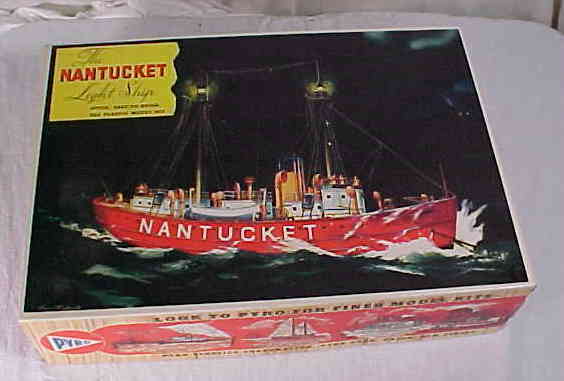 Again we have found this sought after model of the Nantucket Lightship No. 112, by Lindberg Classic Replicas. This kit #717, copyright 1986, is a 1/95 scale replica and one of only a few ever designed of a U. S. light vessel It is also fairly close to HO railroading scale of 1/87. 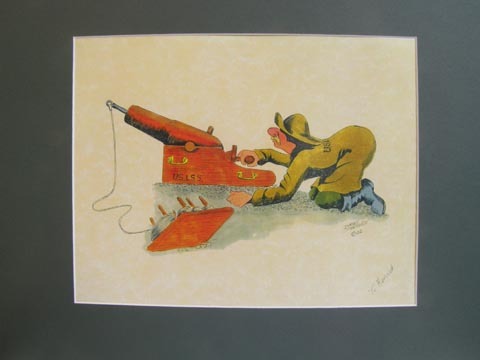 It likely had its origins as the Pyro and Frog kit of the same subject in the late 50s. Lindberg bought the molds and produced the kit for a few years. It has been sought after for many years since going out of production in the late 1980’s. This is complete and un-built, new old stock and is a perfect way to spend the cold days remaining of winter. This is an exceptional find for you lightship enthusiasts as very few were produced and still fewer have survived. (VG+). $78. Sale Price $66. 957-12. 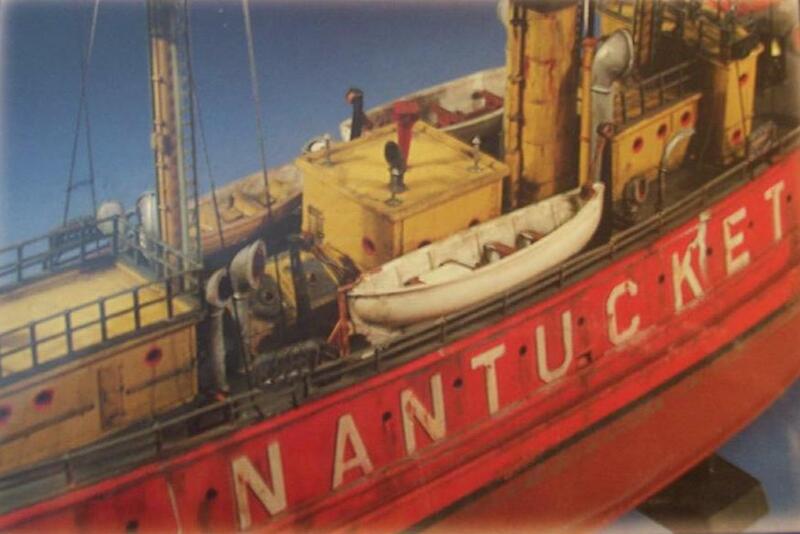 [early lightship model] Nantucket Lightship No. 112. WAL 534. Rarely do we find this earliest version of this sought after model of the Nantucket Lightship No. 112, by Pyro Plastics Corp. No. 238. c.1960’s. This replica is one of only a few ever designed of a U. S. light vessel and has been sought after for many years since going out of production in the 1970’s. This is a 17” (1/95th scale) model kit and is complete in unbuilt condition and is a perfect way to spend the cold days remaining of winter. This early version is an exceptional find for you lightship enthusiasts as very few were produced and still fewer have survived. Have had only two other of this version in 20 years. (VG+). $88. 957o,p,pp. [lightship model] Nantucket [Relief] Lightship No. 112. WAL 534. 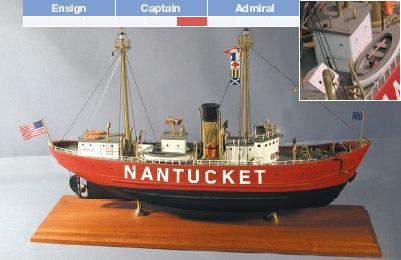 Again we have found this sought after model of the Nantucket Lightship No. 112, by Pyro Plastics Corp. c.1967. This replica is one of only a few ever designed of a U. S. light vessel and has been sought after for many years since going out of production in the 1970’s. This is a 1/95th scale model kit and is complete as-new condition and is a perfect way to spend the cold days remaining of winter. This early version is an exceptional find for you lightship enthusiasts as very few were produced and still fewer have survived. (VG+). $88 net. 957-7. 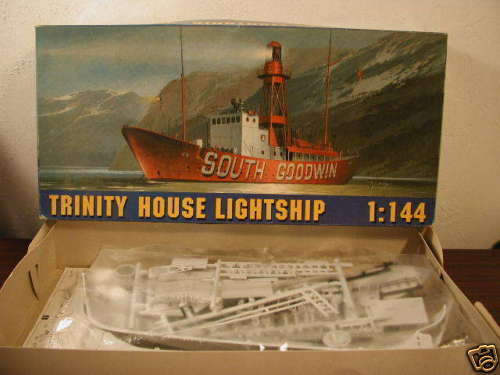 [lightship model] Trinity House South Goodwin Lightship. Again we have another sought after model of a Lightship, this time the British South Goodwin Lightship by the Polish manufacturer Chematic. 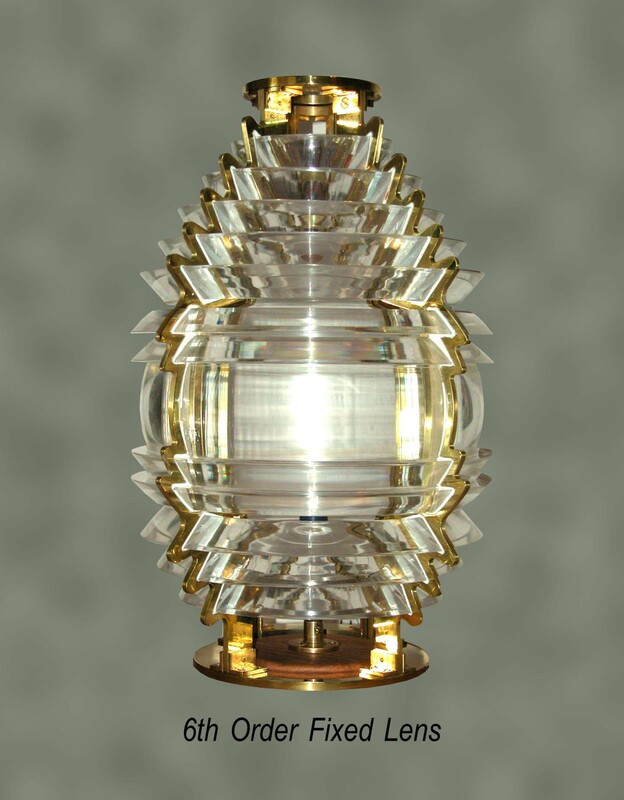 This replica is one of only a few ever designed of light vessel and as such has been in some demand. This is a 1/144th scale model kit containing molded parts in gray and black and is complete and unopened, and is a perfect way to spend the cold days of winter or the heat of the summer in your air conditioned study. Includes original though sparce instructions. 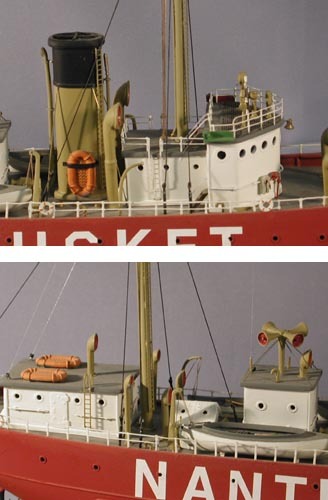 This is an exceptional find for you lightship enthusiasts as very few were produced and still fewer are available. Light wear and ageing to box. (VG). $56. For more lightship and Coast Guard models please scroll down. 22199. 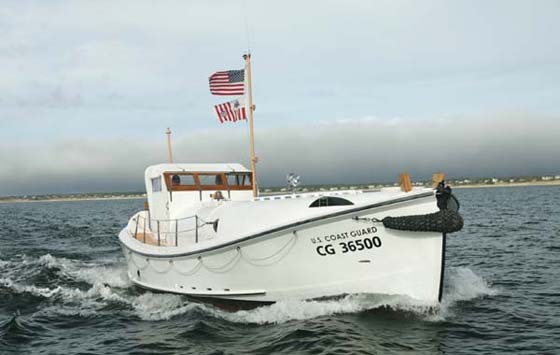 Nantucket Light Vessel LV-112 Model by Bluejacket Ship Crafters. BlueJacket Ship Crafters has been recognized as one of the premier model manufacturers and builders since their opening in 1905. Continuing in this fine tradition, they have produced this 19”, 1/8” scale model of the famous Nantucket Light Vessel No. 112. Before the era of modern aids to navigation, lightships played a crucial role and none more than those on the dreaded Nantucket Shoals. This area of the coastline boasted more light vessels over the years than any other coastline in the world. The ‘112 was built in 1936 following a collision with her predecessor LV-117 in 1934 by the British liner SS Olympic. This model shows her as launched, with a tall stack for her steam boiler, steel pilot house and two masts with 500mm lanterns and lantern galleries. 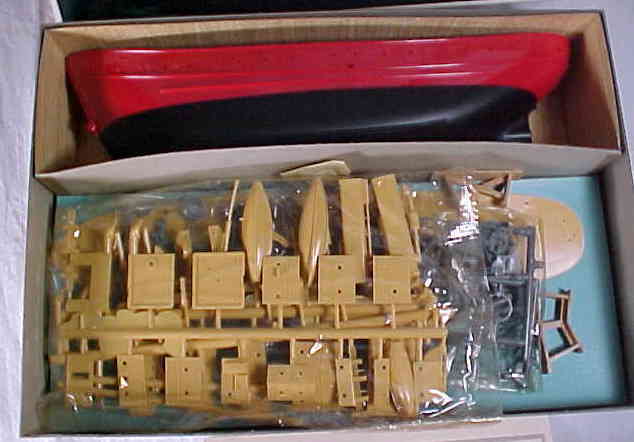 Complete kit includes pre-carved basswood hull, finely cast Britannia pewter and photo-etched brass fittings, all wood, styrene, and other high quality materials needed to complete this dramatic and colorful model. 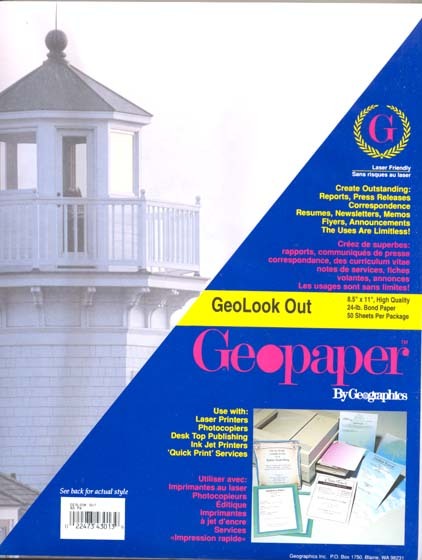 With detailed plans and a 33- page instruction booklet with drawings and color photos. build this great model ship. Scale 1/8"=1', Length 18 1/2", Beam 3 3/4", Height 12". This model will add grace and charm to any office, den or family room and will become a valuable heirloom in years to come. Kit only $289. 21523b. Harbour Lights. FORT WASHINGTON BELL TOWER , MD. HB901. Special limited edition, only 1200 made exclusively for one dealer and the first fog bell tower ever to be released. 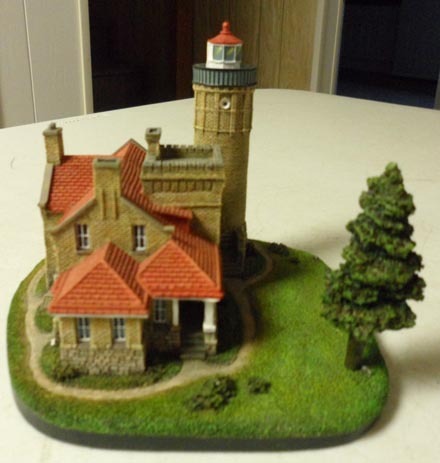 This is the first of a series of historic buildings by Harbour Lights made exclusively for the Lighthouse Depot in Wells Maine ( only 1200 were made ). As new with original paperwork, sure to become a collector’s item. 4”L x 3 ¼”D x 3 ½”H. (M). $59.95. Reduced $46. 26246. [Reproduction SURFMAN’S CHECK] Replica United States Life Saving Service "SURFMAN’S CHECK” replicates those issued in the Nineteenth Century to surfmen patrolling the beach. 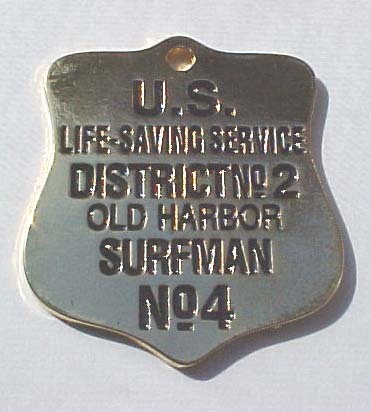 This check, based on an original hanging in the CO’s office at the Coast Guard motor lifeboat station in Chatham on Cape Cod, reads: U.S. * LIFE-SAVING SERVICE * DISTRICT No.2 * OLD HARBOR * SURFMAN No.4. The check is made of brass and has a beautiful polish and black paint-filled lettering. Each surfman, during his nightly beach patrol, would exchange his “check” with that from the neighboring station, thus proving that he had completed his assigned patrol. This high quality replica is on heavy brass and would be perfect for display, as a watch fob or as a gift. Measures 2 1/8” high by 2” wide. (M). Out of stock. 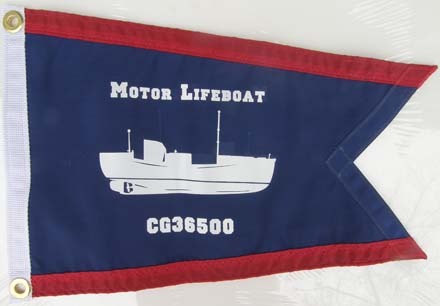 Reproduction of the Original United States Life Saving Service Pennant. Treat your family to this replica of the official sewn U. S. Life Saving Service flag. Flag is professionally made of high quality flag material, with sewn hem and brass grommets for attaching to halyard. Professionally made and will last longer than most others that you may find. 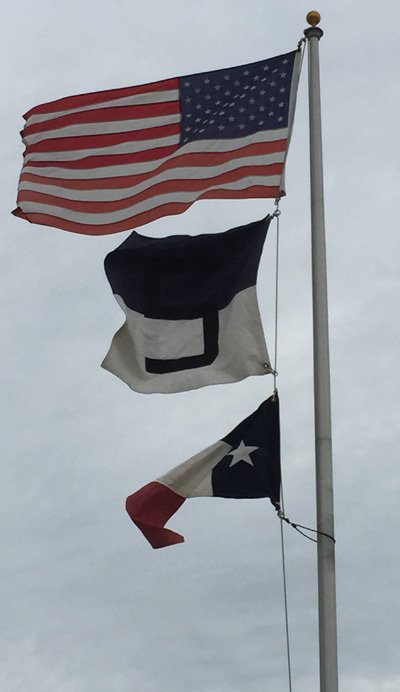 Our pennants are flown at stations across the country as well on vessels of the U. S. Coast Guard and have received the highest praise. 27463. [reproduction] U. S. Life Saving Service Station Flag. This triangular station flag measures 48” long by 25” and is typical of the flags once flown at Life Saving Service stations to identify them as such to vessels at sea. The flag is of the standard design instituted by General Superintendent Sumner I Kimball, with blue, white and red fields and one white star. Heavy duty for moderate weather conditions. Made in America. (designs as shown above, both available) $89.95. 27463M. 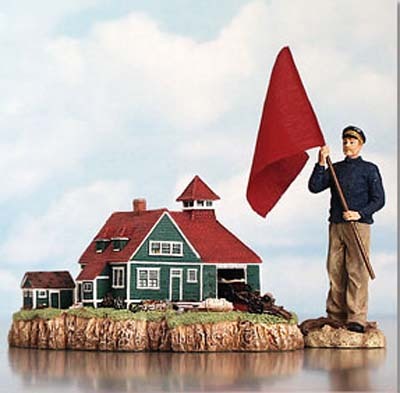 (miniature reproduction) U. S. Life Saving Service Station Flag for Presentation or Framing. 8” x 16” This triangular station flag measures 8” long by 16” and is of the design once flown at Life Saving Service stations to identify them as such to vessels at sea. The flag is of the standard design instituted by General Superintendent Sumner I Kimball, with blue, white and red fields and one white star. 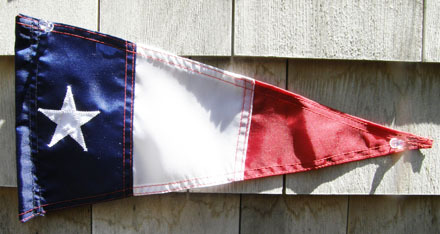 Our flag weight nylon miniature is one sided, appliquéd, no grommets, perfect for framing or as a presentation piece. Made in USA. (M). $49.95. 12239. [reproduction] U. S. Life Saving Service District Number Flag. This square district flag measures 38” by 38” and is typical of the flags once flown at Life Saving Service stations to identify the Life-Saving District as such to vessels at sea. The flag is of the standard design instituted by General Superintendent Sumner I Kimball. 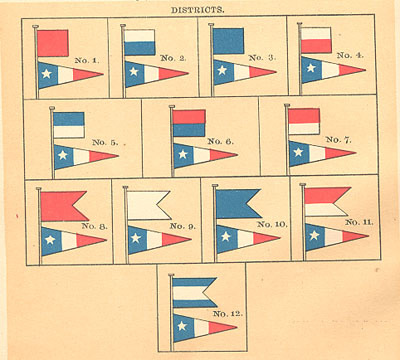 Each district had a distinct design and colors, with the district number in black. Heavy duty for moderate weather conditions. Made in America. (design for District #5 as shown above) $98.95. 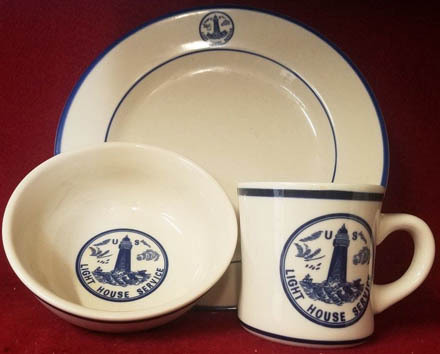 We occasionally have in stock United States Lighthouse Service and Life-Saving Service Logo Dinnerware. Referred to as the “Navy Blue Collection”, this line of dinnerware is made to military specifications. It is made of restaurant grade china similar to that used in hotels, restaurants, on ships and elsewhere and is tough enough to last in these high wear environments. They will not fade and will continue to look good for years to come. In addition, they are microwave and dishwasher safe, and contain no lead. Pattern has been discontinued - please inquire for availability as occasional pieces still show up. 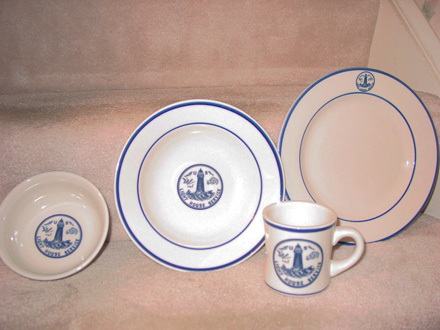 United States Life-Saving Service, Lighthouse Service, Navy Logo Dinnerware. Long ago discontinued, this wonderful quality china is much sought after. We have found a few more pieces of D&D Lines logo dinnerware. 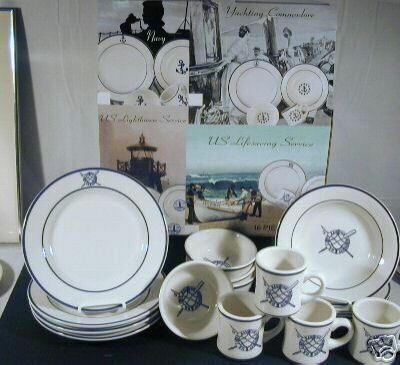 Referred to as the “Navy Blue Collection”, this line of dinnerware is made to military specifications. It is made of restaurant grade china similar to that used in hotels, restaurants, on ships and elsewhere and is tough enough to last in these high wear environments. They will not fade and will continue to look good for years to come. In addition, they are microwave and dishwasher safe, and contain no lead. Patterns have been discontinued but we occasionally find a few pieces. #21384b,c. Cup & Saucer Set “U.S.L.H.S.” in the brown, leafy pattern in use in the late 1800’s until the early 1900’s. (2 sets available). $96 set. #21384. 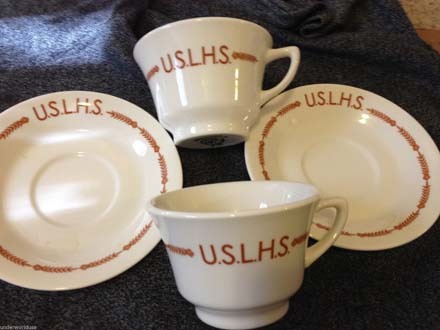 Saucer “U.S.L.H.S.” in the brown, leafy pattern in use in the late 1800’s until the early 1900’s. Saucer only available (3). $34.95. #21385. 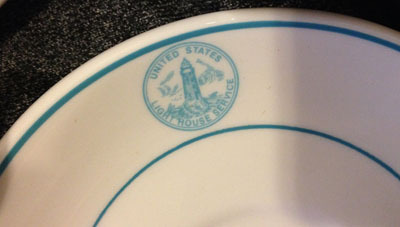 Saucer “United States Light House Service” in the later turquoise pattern. Saucer only available (1). $34.95. 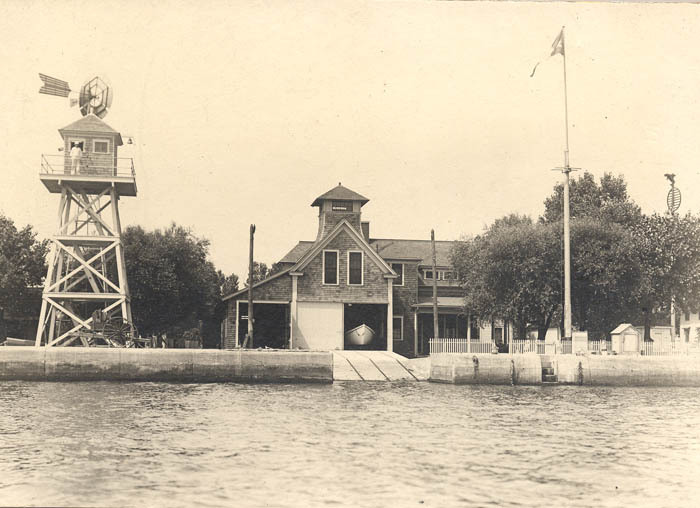 Keeper Baker's Island Lighthouse, Mass c.1920. Bob Trapani of the American Lighthouse Foundation modeling our uniform. 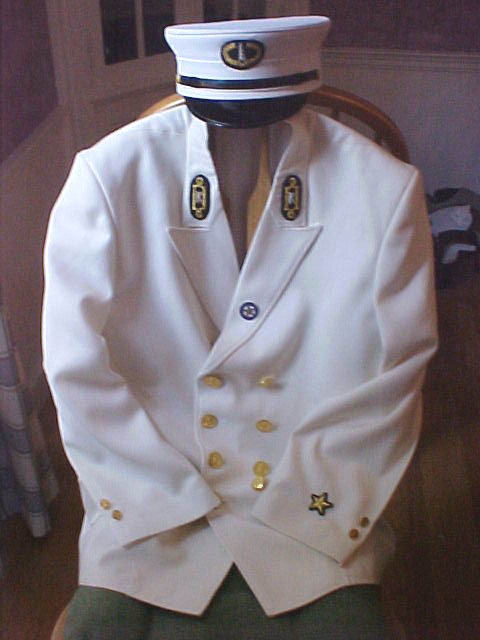 Reproduction U. S. Lighthouse Service Uniforms. 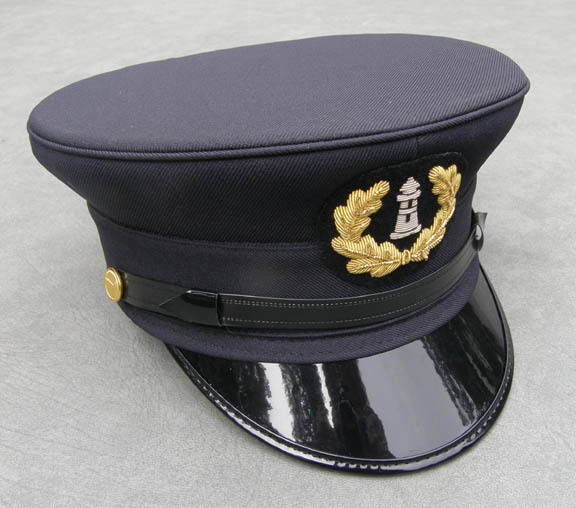 After repeated inquiries, we have begun offering tailor made Reproduction c.1900 Lighthouse Keeper’s Uniforms. Perfect for museum interpreters and tour guides, these uniforms are tailor made to your size and made to U. S. Lighthouse Service c.1900 design. Made in America. Uniforms include “bell top” cap, 8-button double breasted jumper with matching pants. 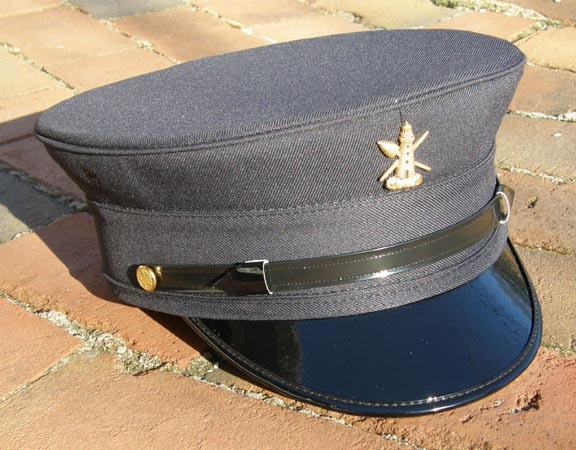 Either reproduction or authentic buttons and insignia are available to meet your requirements. The Outer Banks Conservationists noted: “This one worked out perfectly for us, and we will continue to put it to good use with Brent going into classrooms and being "on duty"….The Park is very much in favor! " 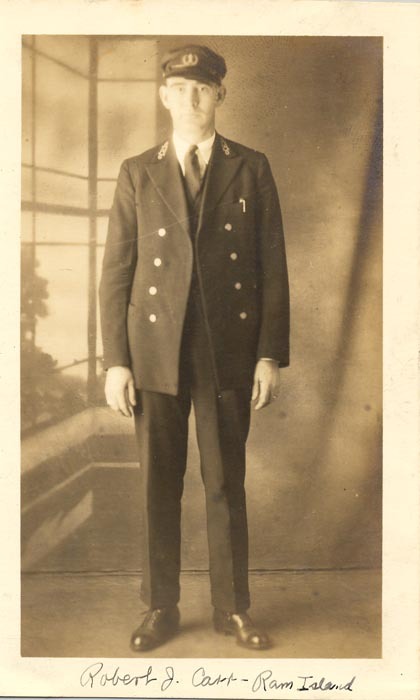 Richard C. in Muncie, Indiana wrote of his uniform: "I received the Assistant Keeper's Uniform today and I am very impressed with the quality and craftsmanship that went into it. Thank you very much - it fits exceptionally well and you were right, the efficiency badge and the 5-year strip on the sleeve really and an extra nice touch to the uniform. I will wear it proudly and, with your permission, I would like to tell everyone exactly where I purchased it. Thanks again for a wonderful product." 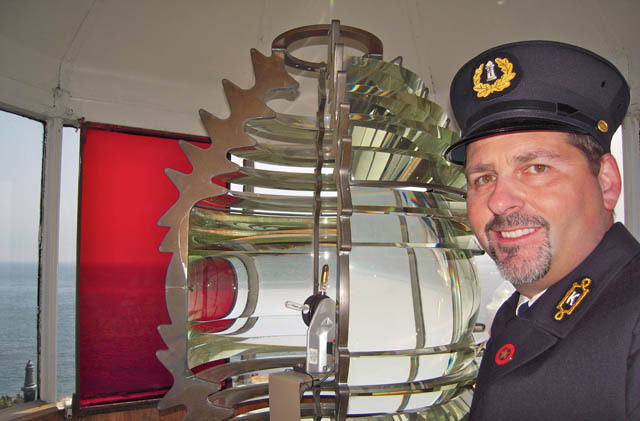 Keeper Michael D. Bedard (USCG-Aux 11-2 Woods Hole) at Nobska Lighthouse on Cape Cod wearing our uniform. Winter uniform in 13 ½ oz blue wool serge-like (55%/45%) poly wool) material, summer white 11 ½ oz (for warm climates). 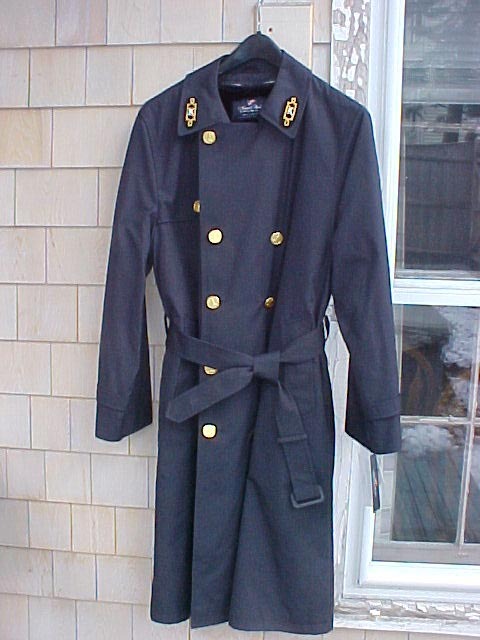 Keeper's overcoat / trench coat, water repellant (shown below). 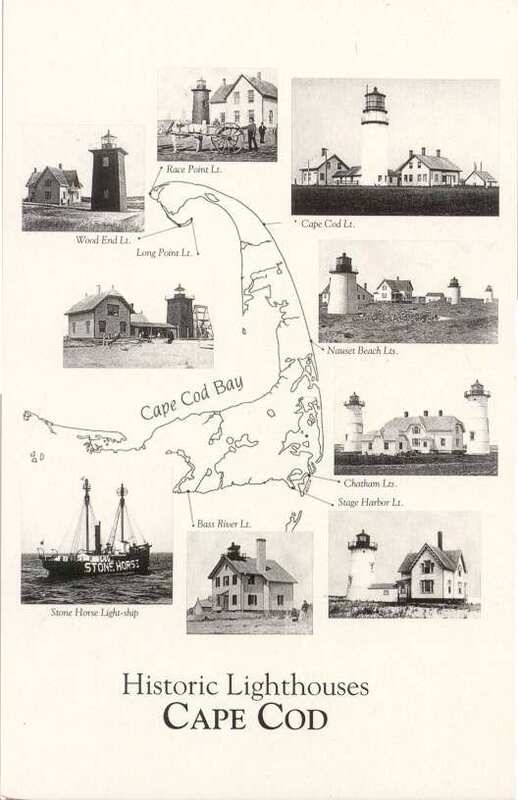 The 1912 report of the Bureau of Lighthouses to Congress stated, in part, “To promote efficiency and friendly rivalry among lighthouse keepers, a system of efficiency stars and pennants has been established. To this end a system of efficiency stars and pennants was established. 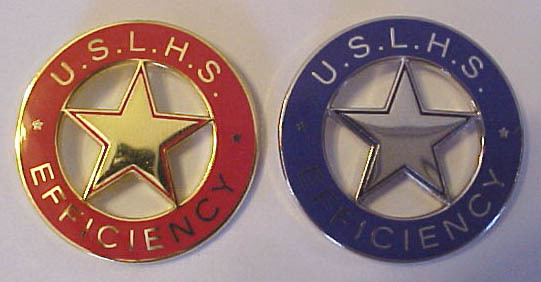 Keepers who were commended for efficiency at each quarterly inspection during the year were entitled to wear the Inspector’s star (red enamel on gold) for the next year. Those who received the Inspector’s star for three successive years were entitled to wear the Commissioner’s star (blue enamel on silver). We now offer exact reproductions of the Inspector’s and Commissioner’s stars. The inspector’s star is red enamel on brass, and measures 1 1/8” inches in diameter (#2511a). The Commissioner’s star is the same size but is blue enamel on brass (#2511b). Each just $8.95. Photograph by Janine Slater , courtesy Outer Banks Conservationists. Shown with permission. 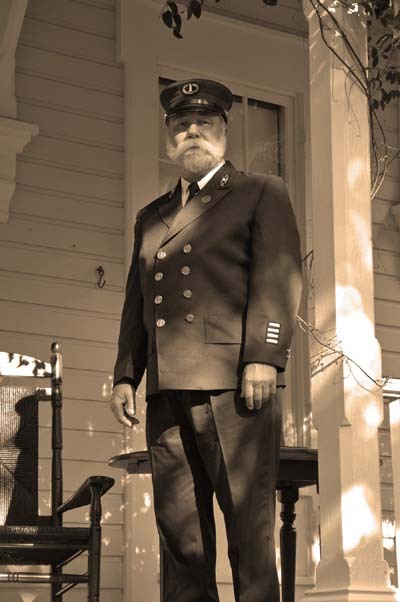 Keeper Alvin Glatkowski, Currituck Beach Lighthouse, poses in his recently acquired uniform. 2383. Reproduction U. S. Life-Saving Service right arm insignia patch. 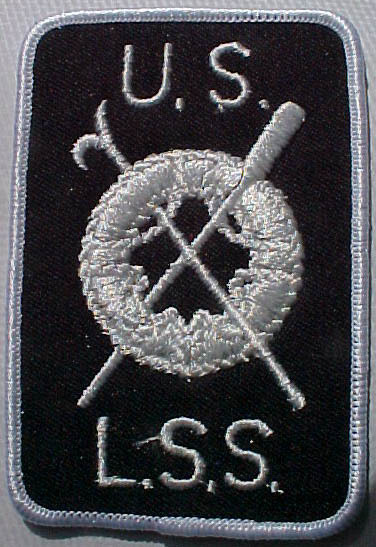 Insignia shows “ U.S. ” over life ring with crossed pike and oar, over “L.S.S.” Reproduction patch is embroidered in white on black, measures 2 ½” x 4” and would be perfect for display or for mounting on your uniform. (M). $18. 26246. [Reproduction SURFMAN’S CHECK] Replica United States Life Saving Service "SURFMAN’S CHECK” replicates those issued in the Nineteenth Century to surfmen patrolling the beach. This check, based on an original hanging in the CO’s office at the Coast Guard motor lifeboat station in Chatham on Cape Cod, reads: U.S. * LIFE-SAVING SERVICE * DISTRICT No.2 * OLD HARBOR * SURFMAN No.4. The check is made of brass and has a beautiful polish and black paint-filled lettering. Each surfman, during his nightly beach patrol, would exchange his “check” with that from the neighboring station, thus proving that he had completed his assigned patrol. This high quality replica is on heavy brass and would be perfect for display, as a watch fob or as a gift. Measures 2 1/8” high by 2” wide. (M). $9.95. 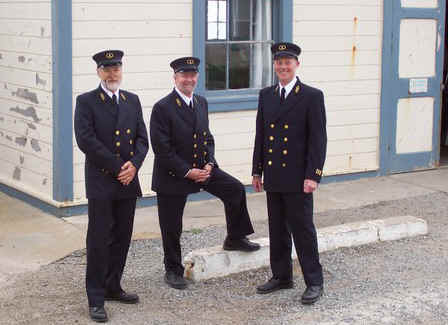 Shown above left are the "keepers" at Pigeon Point Light Station in their recently acquired uniforms. Above right Keeper's overcoat. 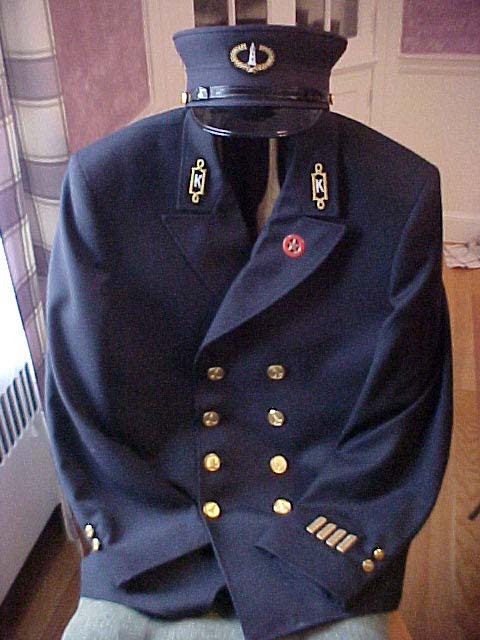 Hat, jacket, pants, overcoat, shirt, tie, garrison belt or complete reproduction uniforms are available. Please inquire for pricing and more information. D-10-1. (caps) U.S. Life-Saving Service. 6-Panel pigment dyed stone washed cotton twill, 3" unstructured relaxed crown, fabric strap with classic metal buckle. Proceeds will be donated to the Michigan Lighthouse Conservancy. Please state color. (M). $16.95. Sold Out. 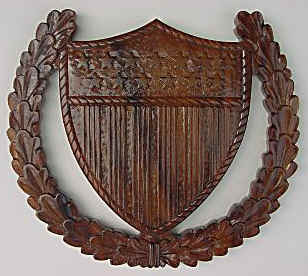 Coast Guard Emblem Plaque. 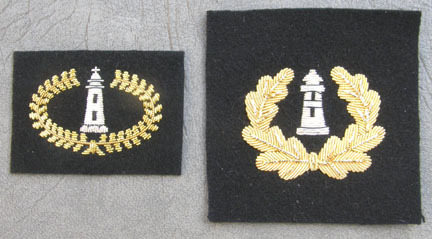 (plain crossed anchors). 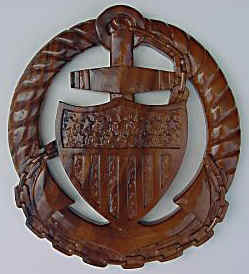 Coast Guard Emblem, "Painted Gazette". 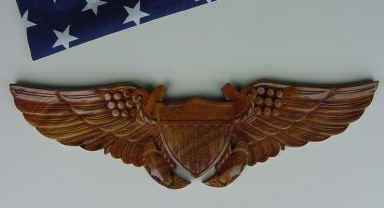 Coast Guard Recruit Company Commander Plaque. Coast Guard Port Security Plaque. Coast Guard Command Ashore Plaque. Coast Guard Boat Force Plaque. 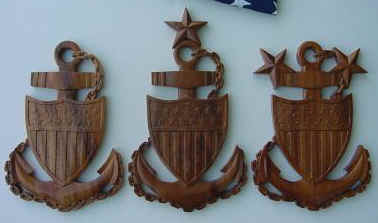 Coast Guard Pilot, Air Crew, and Flight Officer Wing Plaques. 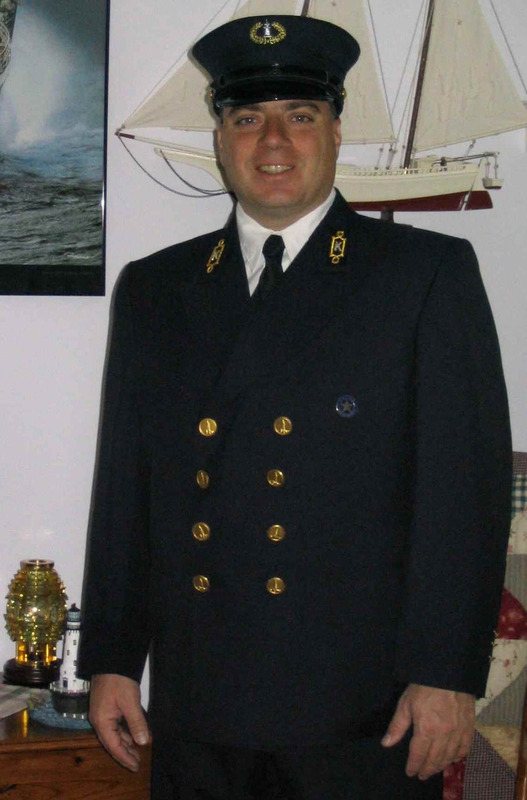 Coast Guard Recruit Company Commander. Please inquire for current pricing. 10281. [reproduction] U. S. Lighthouse Service Station Flag. 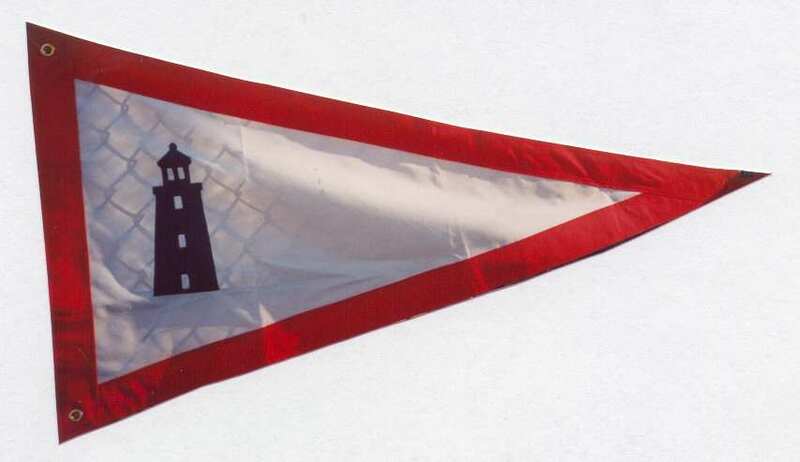 This triangular station flag measures 48” long by 25” and is typical of the flags once flown on Lighthouse Service vessels and at the light stations for over one hundred years. The flag is of the standard design, with red border on a field of white, with a large blue lighthouse silhouette. Heavy duty for moderate weather conditions. Made in America. $98.95. 20418. [flag] U. S. Lighthouse Service flag. This similar triangular station flag measures 48” long by 25” and is made of cotton - polyester for light to average weather conditions or for display. The flag is of the standard design, with red border on a field of white, with a large blue lighthouse silhouette. Made in America. (design as shown above) $79.95. 20418L. [flag] U. S. Lighthouse Service flag. This similar triangular station flag measures 48” long by 25” and is made of a lighter weight cotton - polyester for light weather conditions or for display. The flag is of the standard design, with red border on a field of white, with a large blue lighthouse silhouette. Made in America. (design as shown above) $54.95. 21426. . [reproduction] U. S. Lighthouse Service District Superintendent’s Flag. 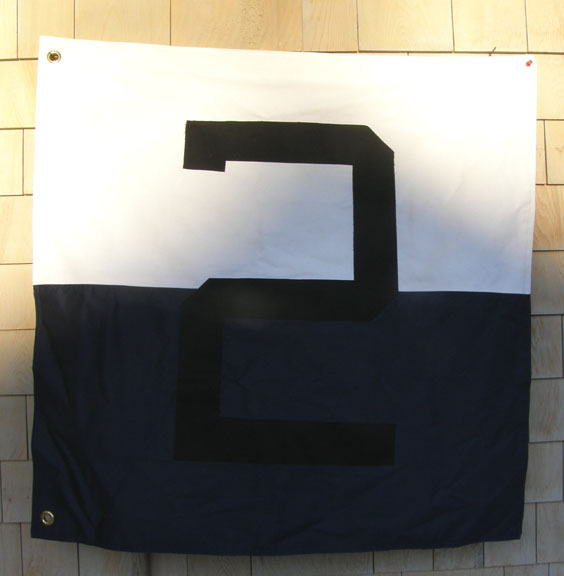 This rectangular flag measures 48” long by 24” and is typical of the flags once flown on Lighthouse Service Tenders when the District Superintendent was on board. The flag is of the standard design, with navy blue border on a field of white, with a large blue lighthouse silhouette. Made in America. $149.95. 21425. [reproduction] U. S. Lighthouse Service District Inspector’s Flag. This triangular flag measures 48” long by 25” and is typical of the flags once flown on Lighthouse Service Tenders when the District Inspector was on board. The flag is of the standard design, with navy blue border on a field of white, with a large blue lighthouse silhouette. Made in America. $98.95. 2267. 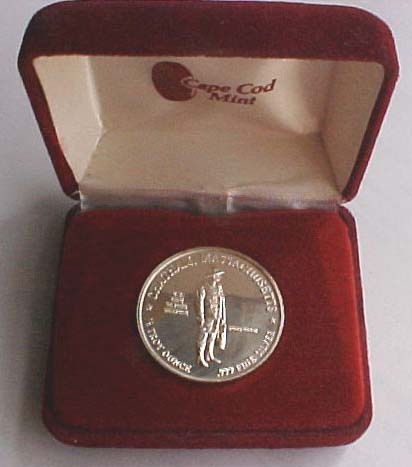 [commemorative coin] 1 ¼” silver coin commemorating the Centennial of the Peak of the U. S. Life Saving Service in Chatham, Cape Cod Mass. Issued in 1983, the face has a raised figure of a lifesaver on foul weather gear with lantern and flare in hand, with “Surfman” in raised letters to his right and “U.S. 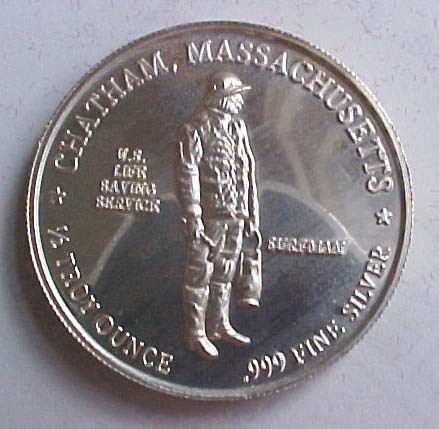 Life Saving Service” to his left with “Chatham Massachusetts 1/2 troy ounces, .999 fine silver” around border. Obverse has raised scene of surfboat being rowed to a wrecked ship during a violent storm with “Lifesavers Of Chatham Peak Of Service Centennial 1883 1983” around border. Coin comes in its original fitted maroon velveteen box which has Cape Cod Mint in silver letters on white satin inside cover. Each bronze and silver coin is one of only 1000 minted by Larry Williams of Cape Cod Mint in 1983. This remains a fine, sought after Cape Cod life-saving commemorative piece. (M). Silver $74 net. Bronze $58 net. 21444. Lighthouse Stationery. Create outstanding Letters, Reports, Correspondence, Memos. High quality, 8½" x 11", 24lb. bond paper available in packs of 25, 50 or 100 sheets, compatible with Laser Printers, Photocopiers, and Ink Jet Printers. Pack of 25 sheets $3.99. Pack of 50 sheets $5.99. Pack of 100 sheets $7.99. 2352D. 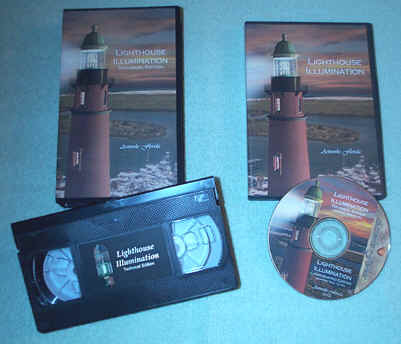 Lighthouse Illumination on DVD: Both editions digitally mastered on DVD. $19.95. Full Size Reproduction Fresnel Lenses. 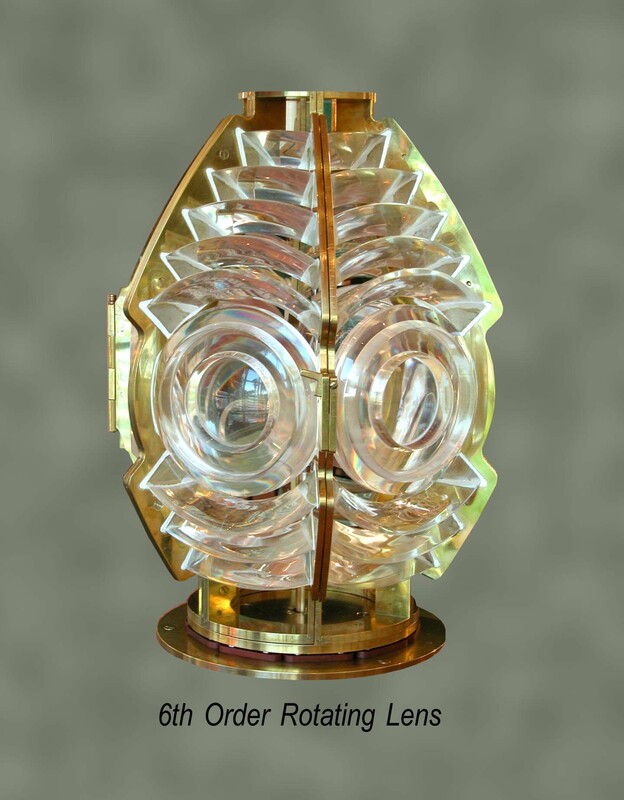 Full size 4th and 6th order operating Fresnel lens reproductions are now available. 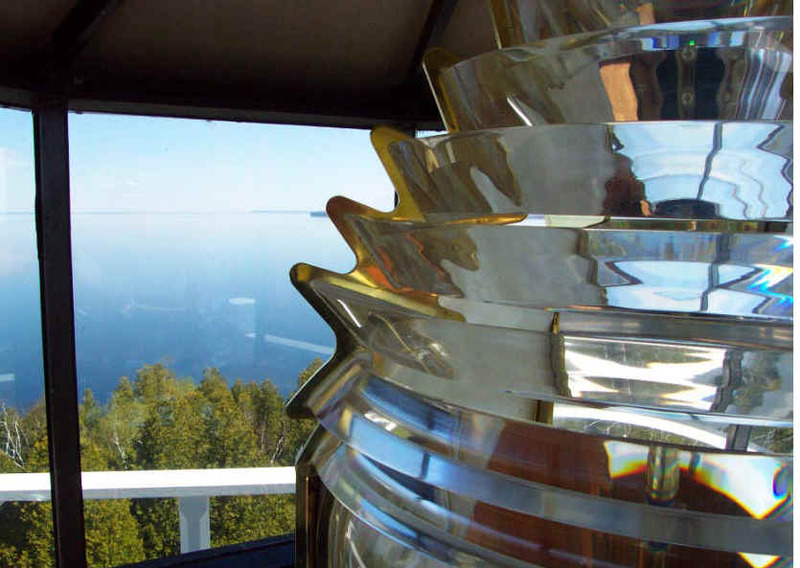 Specially made in the United States of high quality brass and high temperature acrylic, these lenses will make a beautiful addition to your museum collection or for actual lighthouse display. The lenses are made of an optical UV resistant acrylic and the frames are made of solid brass, complete with bottom frame, or trolley wheels if rotating. Delivery time is about 12-16 weeks from order confirmation. 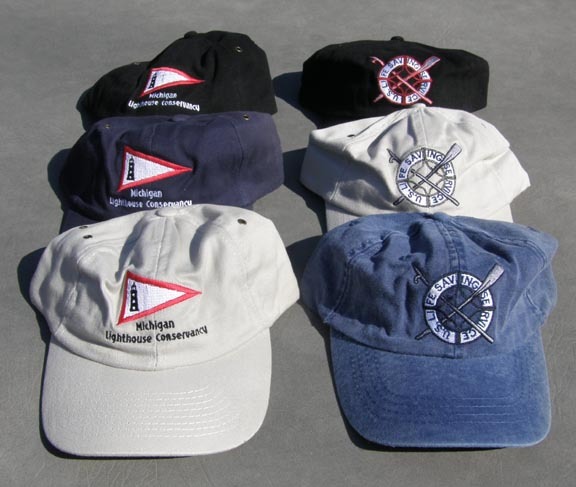 Other sizes and styles, and options are available on request. Fourth Order Fixed Lens: The height of the 4th order is 36 inches with a 250 mm focal distance. The inside diameter is 500 mm (19.68 inches). The lens is as original, with an operating door for tending the “lamp”. Fixed lenses with open back or reflector can be specified as well. The approximate weight is 250 lbs. for the fixed and 325 lbs. for the rotating. Included is the lens and a modern lamp holder. A cast iron pedestal is also available for an additional cost. Sixth Order Fixed Lens: The height of the 6th order is 22 inches with 150mm focal distance which makes the inside diameter of the lens 300mm (11.81 inches). The approximate weight of the lens is 75 lbs. for a fixed lens and 125 lbs. for a rotating lens. Below are some additional photos of a 4th order replica lens recently installed at the Pottawatomie Lighthouse in Wisconsin. Prices quoted on request - please inquire. More Just Arrived - Fill the gaps in your collection for just $4 each. #1371. The Danbury Mint is a world-leader in the design, development and marketing of fine collectibles. For over three decades, they have been serving the needs of collectors to acquire keepsakes of lasting meaning, beauty and importance. They take great pride and pleasure in presenting collectors and enthusiasts with a varied and ever-changing assortment of quality products. Examples include: exclusive figurines, commissioned from leading sculptors and hand-painted to perfection…dolls from the world's leading designers, produced to exacting standards of quality and workmanship…die-cast metal vehicles that require years of painstaking research and design and consist of literally hundreds of individual parts…and fine porcelain plates featuring full-color art from leading artists in the United States and around the world. Most over 7" high. Here is a wonderful chance to fill in those gaps in your collection. We have been fortunate to acquire a collection that has been in the making for over 20 years. All replicas are as new in original box and packing, most with certificates of origin. Reduced to $4 each . Available are: Kann Non Zaki LH, “Mariner’s Cove”, Le Cap Frehel LH [France], Lobbjerg LH [Denmark], Calaburras LH [Spain]. CP-01. Historic Lighthouses Cape Cod Print. The Historic Lighthouse series of prints uses rare photos from the 1800’s showing American Lighthouses in their turn-of-the-century splendor. Using sophisticated twentieth century computer enhancement, these specialized prints are produced on quality 80lb. bright white paper stock. Each print shows beautiful clear 1800’s views from original period photographs. These prints measure 18" wide by 24" high and, because of the fine quality, these make wonderful candidates for framing and decorating. Watch also for future prints featuring vintage photographs and architectural plans of other locations. (Actual size 18"w x 24"h, shipped rolled.). Historic Lighthouses - Cape Cod. Retail priced at $19.95. Dealer and wholesale pricing available. 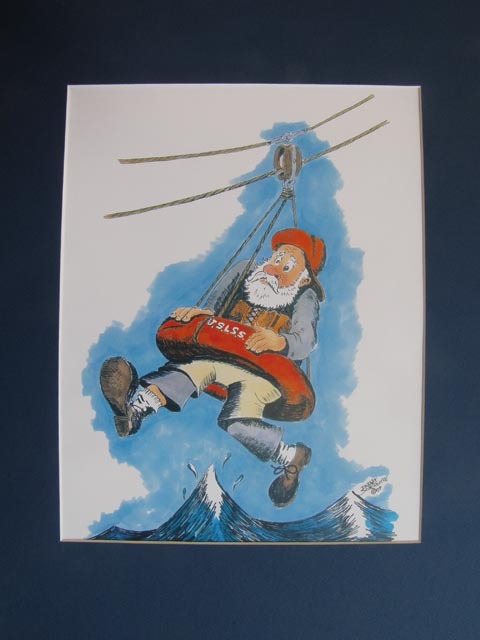 Similar postcards also available at wholesale prices. Martha is a resident of Ashland Massachusetts. She has loved art her whole life. As a child she won a scholarship to the John Heron Art Museum School in Indianapolis, where she sold her first portrait. Since then she has been commissioned to do portraits of people, animals and houses in pastels and has won numerous awards for her artwork and photography. 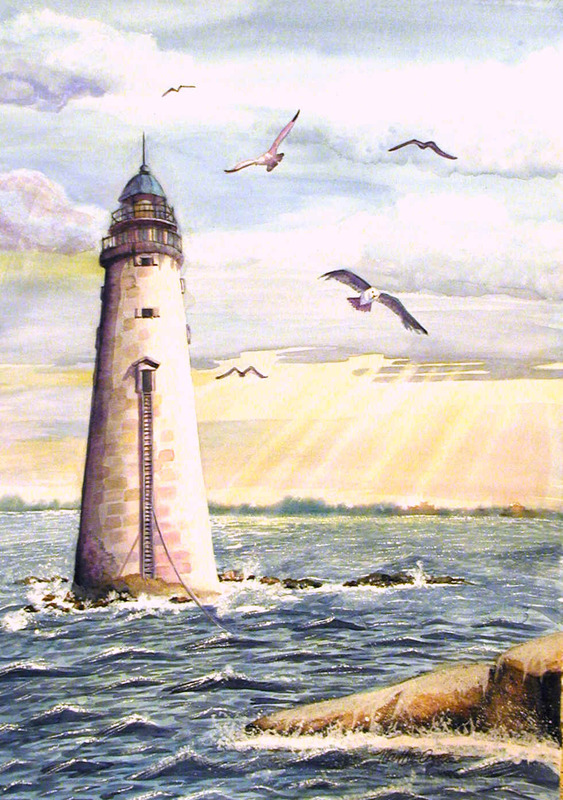 Martha has taken up painting lighthouses, since the commission of a wedding picture of two of her good friends, who were married in front of the Brant Point Lighthouse. Martha loves the beauty of the ocean, the breezes and the sounds and tries to capture these feelings and combine them with the history of each lighthouse she paints. 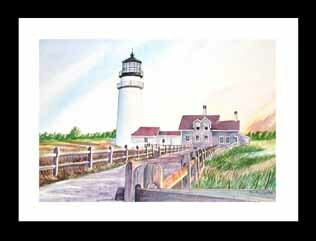 Martha will paint your favorite lighthouse in pastels or watercolors from your photograph. For information, email her at Mayotte22@aol.com. Protect your valuable collection and those delicate dust jacket covers. For a cleaner, more attractive alternative try our adjustable clear jacket covers. Available to fit books with dust jackets up to 16""high. Simply slide the dust jacket into the pre-folded 1.5 mil Low Glare polyester cover. Fold the open edge over the dust cover, secure the cover with three convenient self-anchoring tabs, and crease. 20” wide. $2.25/ft or 50 ft roll $98. 22354. FRANK’S ISLAND LIGHTHOUSE, LOUISIANA CCM13664. Lefton’s Historic American Lighthouse Lost Lights. Louisiana's Frank's Island Lighthouse has been masterfully replicated by The Lefton Company in their "Lost Lights" commemorative series of lighthouses. 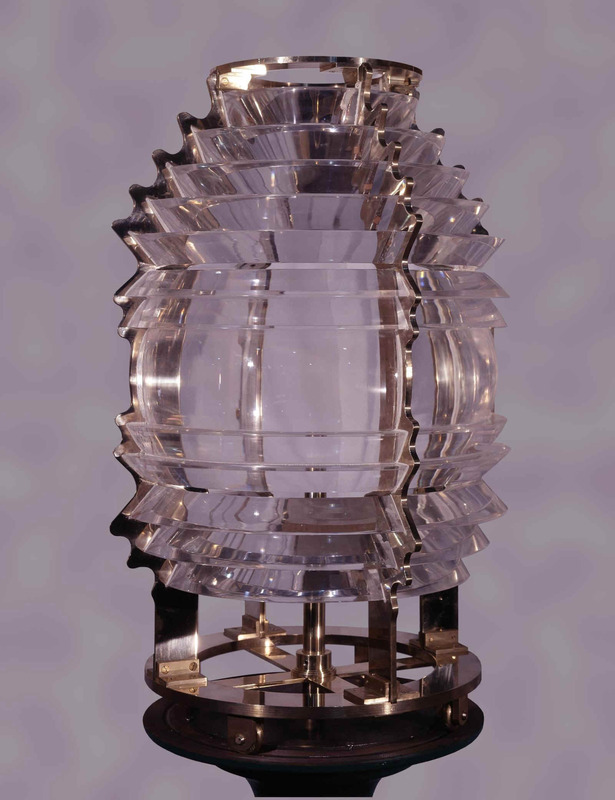 The Frank's Island Lighthouse is from Lefton’s very first series of the "Lost Lights" collection and was limited in production to only 5,000 pieces worldwide. Lefton worked with the U.S. Lighthouse Society to assure that each of their "Lost Lights" lighthouses is an authentic reproduction of the original, and the results are remarkable, highly-detailed pieces of art and history. Every one of the limited edition lighthouses is individually numbered and comes on a base with a brass nameplate. Each lighthouse also comes with a hang tag describing the lighthouse and its history and has a certificate of authenticity. Additionally, every lighthouse is packaged in a splendid collector’s tin. The Frank's Island Lighthouse is approximately 6" high and 4" wide. Quite difficult to find now. (M). $46 net. #C746. Superb b/w view printed from an original glass plate negative shows the interior of a turn of the century boatroom. Crisp, clear 5" x 7". View shows a surfman posing in front of surfboat, beside sits the faking box and life buoy. Hanging from the ceiling can be seen a Francis metallic life-car. On the interior walls can just be seen a number of signs, one of which reads "San Francisco". From details of the exterior trim and ramp visible, this might be a "Witch’s Hat type" station, such as those in use at Point Reyes and a number of other areas on the Pacific Coast. Slight line from crack in negative doesn’t detract from this clear, detailed view. B/w photo 5" x 7" $9. Matted to 9" x 11" and ready for framing $22. 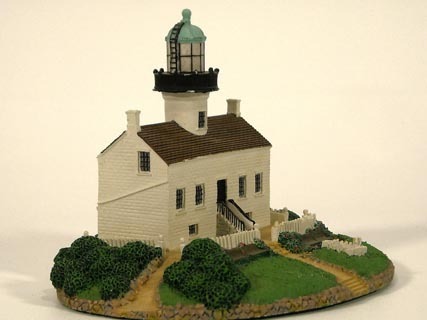 [Cut and assemble lighthouse kits] Unusual CUT AND ASSEMBLE LIGHT-HOUSE KITS. 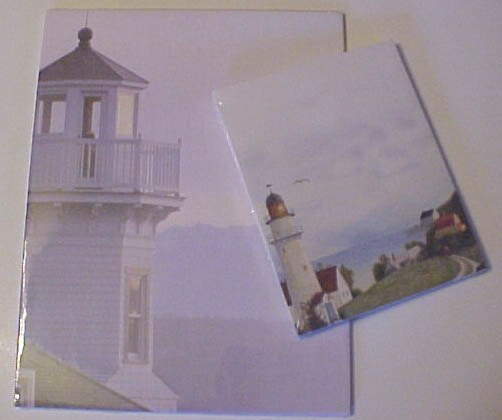 Ready to cut out and assemble, these kits in booklet form feature three-dimensional scale mini models of U. S. lighthouses. Original vintage kits feature step-by-step instructions and clear diagrams and with a few simple tools and some glue, papercrafters of all ages will enjoy assembling these interesting models, or keep them intact as collector’s items. PC-224, 225. PORTLAND HEAD LIGHT, MAINE, color and assemble by Oxford Crafts, 1977. (VG). $18. PC-215. OLD POINT LOMA LIGHTHOUSE, CALIFORNIA. By 101 Productions, 1969. (VG-). $18. 27264. 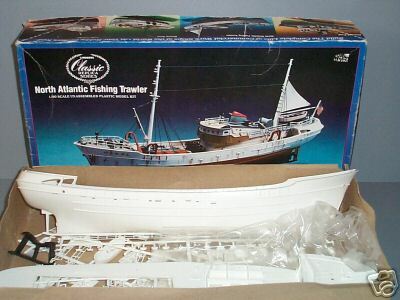 [model] North Atlantic Fishing Trawler, Plastic Model Kit. c.1984. Substantially complete vintage plastic model kit by Lindberg Products Co. Model reproduces this little known workhorse of the fishing industry in good detail. Completed model is 17” long, 1/90 scale. Unassembled kit has been opened and hull begun to be glued together, otherwise unassembled. Kit appears to be complete, some wear to box. Without instructions. Scarce early model. (VG-). $34.95 net. 21469b. [ship model] Diesel Tug. c.1984. Again we have found this sought after model by Lindberg Classic Replicas. This is a 1/82nd. scale 14" model kit and is complete and unopened, in as-new condition and is a perfect way to spend the cold days remaining of winter. This is an interesting find and sure to please that ship enthusiast in your family. (M). $22 net. For recent books, please see New Release page. This page updated October 25, 2018 . All text and illustrations on web site Ó James W. Claflin . 10/25/2018 All rights reserved. Use prohibited without written permission.